1. Break cauliflower into florettes, discarding the central stem. Slice them thinly and put them in a bowl. 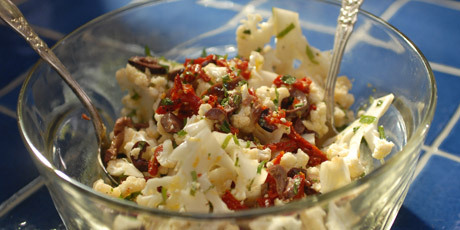 Toss with the garlic, tomatoes, olives, tarragon, and lemon zest. Squeeze over lemon juice. Pour over olive oil. And season with salt and pepper. Taste and adjust quantities to suit your tastes.